Hello, lovelies~ Lovely weather we're having, huh? Well, technically, it's not that lovely if it rains all day and flood like crazy. So, tell you what, let's just do a blog tag, shall we? I will have questions that you will need to answer related to our lovely RAINY weather (since Indonesia doesn't have winter). First of all, rules. Let's just set it straight. I will have these questions answered and you are free to tag anyone you want. Simple, right? 'kay, let's start! 1. What do you like about rainy days? 2. Do you have a favorite drink and/or food for rainy days? 3. 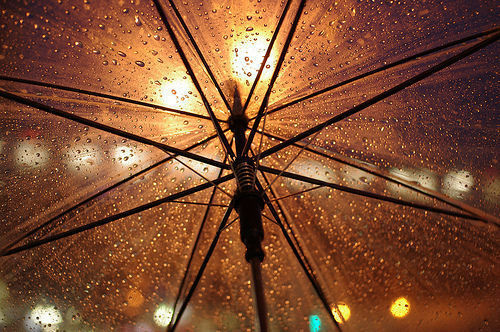 Do you have a certain song that you like to play over and over again during this rainy season? 4. Imagine being in your room on a rainy day. What do you like to do most? 5. What clothes you like to wear most during rainy days (aside from rain jackets)? 6. What makeup item do you use the most when it's rainy season since the air does get cooler? 7. Finally, what memories do you have when it's raining? One of your favorite memory. # I like how the temperature becomes cooler, the smell of rain (called petrichor), and the sound of rain gently rapping on the roof. # I love, love, love soup based food (be it instant noodles or egg drop corn soup) paired with a glass of hot green tea or hot chocolate. # Usually mellow songs, but right now I am so in love with crack Utatta by keeno feat. Lon. # I would usually light one of my Yankee Candles and watch Hidamari Sketch, Polar Bear Cafe or any TV Series while drinking a glass of hot green tea. 5. What clothes or fashion item you like to wear most during rainy days (aside from rain jackets)? # I use my lip balm and hand cream a lot more often during this season. 7. Finally, what memories do you have when it's raining? One of your most favorite memory. There ya' go, ladies and gents!! Now, I tag each and everyone of you who is currently reading this blog post. However, I wanted to specifically tag these people below to do the tag.